Maithri is from near Mysore in South Karnataka. At the age of twenty one she got a job in the human resources department of a tech company during Bangalore’s tech boom. She didn’t quite feel at ease and often questioned the point of her corporate job. Eventually, she quit her job a few years later and found Amrita Bhoomi, the peasant agroecology school set up by the farmer’s movement KRRS. She became a full-time volunteer there and was actively involved with the institution for two years. During this time she helped to organize various farmers training camps including an international Zero Budget Natural Farming training camp with more than 40 international farmer activists from around the world. Her work at Amrita Bhoomi and being in the thick of the farmer’s movement was a real game changer for Maithri and where she developed her politics. “It’s where I learned about farmers issues, capitalism, economic policies, social justice, and what not”. Maithri also went on a special training course for political educators carried out by the Movimiento Sem Terra (MST) in Brazil every year. 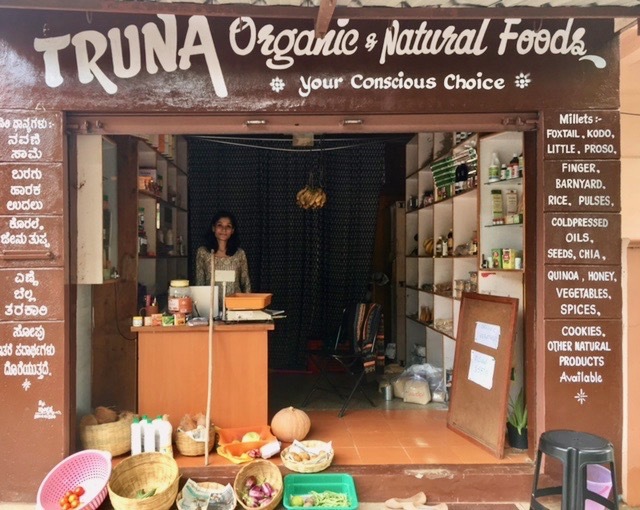 That sealed the deal, and Maithri decided that she wanted to become deeply involved in a livelihood that also contributed to conserving nature, empowering people, and creating social justice. “I want to expand operations in the future and especially create more awareness among consumers.” Maithri points out that consumer commitment is quite low. “Some argue with me and say something is not completely organic or that prices are slightly higher. It’s difficult to be 100% chemical free, and I can’t always guarantee this for all products- mostly I try to support the small farmers and women who bring in home made food products like laddoos. I inform the consumers when something is not guaranteed chemical free. When it comes to spending on luxuries like jewellery, people don’t think twice, but a one rupee price increase on vegetables seems to press their buttons. We really need to educate consumers, I believe that food is one’s medicine. We should see local and natural food as our political and social commitment and an investment in our health,” says Maithri.